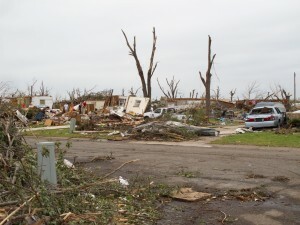 I had planned on visiting Joplin on my last road trip back in 2007, but did not have enough time. This time Joplin again was on my itinerary. I just didn’t think I would be here under these circumstances. 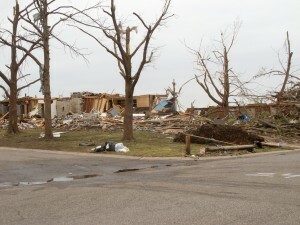 I was in northwestern Arkansas last Sunday when the tornado destroyed parts of Joplin. The news was grim and information about volunteering was not very straight forward in the beginning. I felt the need to do something and so I decided to drive the short drive from Arkansas to Joplin and to help out in any way, shape or form I could. I had called the volunteer hotline (417.625-3543) to confirm that they needed basic laborer. I was told to come to the Missouri Southern States University Recreation Center on 3950 Newman Road to sign up. I found a campground only ten miles east of Joplin and was all set. I arrived early afternoon on Friday and I was greeted by a heavy thunderstorm, lightning bolts shooting straight down from the skies. Fortunately, the storm was short lived. I didn’t know how I would react to so much devastation. I don’t have TV and I only heard the news reports on the radio and saw some photos on the internet. If you would only drive past Joplin on I-44 you wouldn’t even know that anything happened to the town. Many of the main drags are unharmed. 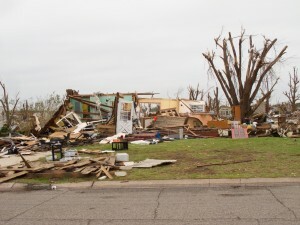 It isn’t until you get west of highway 71 between E. 26th Street and E. 7th Street that you really get to see the devastation. 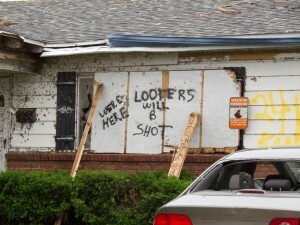 That’s where the brunt of the tornado hit and destroyed home after home after home. A lot of trees were down, but it was really weird to see trees standing with absolutely no leaves left on them. After I filled out some basic paperwork a small group of volunteers and I where taken to Kansas Avenue. Our job was to clear the front yard of a home of building debris and fallen trees. I worked alongside a group of firefighters from St. Louis who had brought their chain saws and some women who didn’t even have gloves to pick-up the debris. There are a lot of people here who just want to help and there is plenty of work to be done. I am not sure how long I’ll stay, maybe a week, maybe longer, I don’t know yet. I’ll try to blog while I am here, but given my track record and the circumstances, I don’t know how often that will be. I am taking some photos while I am out cleaning up, but my main focus is to clean-up. I don’t believe in horoscopes, the one below is mine for today. It could not have been any more fitting.